Demand for single-use, disposable foodservice products in the United States is forecast to increase 3.2% annually to $21.8 billion in 2021, driven by the increased options and convenience of meals prepared or consumed away from home. Demand will also be supported by a shift toward the use of higher value products featuring durable plastic or compostable materials. 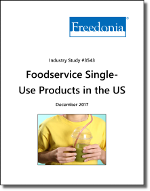 This study examines the US market for foodservice single-use (disposable) products. For the purposes of this study, “single-use” products refers to items used in the service of food and beverages that are intended to be disposed of after use. Items with increased durability that allow multiple uses for various applications, such as plastic takeout containers, are included. Disposable items used for the preparation of food or beverages that do not reach the end user are excluded. Product segments covered include packaging and serviceware. Packaging can be either primary or secondary and refers to the means of enclosing the food items, such as containers, lids, wraps, bags, etc. Serviceware refers to the items used to aid the consumption of the food item, such as plates, bowls, cups, utensils, napkins. Also included in the serviceware segment are products that facilitate foodservice and contact the consumer, such as table and tray liners, toothpicks, coffee cup sleeves, and moist towelletes. Excluded are products sold at retail for home use, though disposables for commercial use that are sold in retail outlets such as club stores are included. Also excluded is packaging for supermarket and convenience store items not prepared at the store (e.g., fresh produce, baked goods, deli meats, etc.). Historical data (2006, 2011, and 2016) and forecasts for 2021 are presented for demand for foodservice disposable products by unit and value in current dollars (including inflation); demand data by market is presented in current dollars. Also presented are historical and forecast data for raw material usage in foodservice disposables in pounds and total dollars. “Demand” (or sales) is defined as all shipments from US plants, plus imports minus exports.